The annual wildland fire emissions of carbon and CO2 (tonnes) are expressed as GeoTIFFs of 0.01 degree (~1-km) spatial resolution. The complete set of carbon emissions, PM, and fuel estimates are provided as ESRI Shapefiles. Emissions were estimated using the U.S. Forest Service Consume model (Prichard et al., 2009). User's Note: The contents of this data set do not represent the full functionality of the WFEIS tools (http://wfeis.mtri.org/). Figure 1. CO2 emissions in tonnes from a northern Texas fire in 2001 estimated by the Wildland Fire Emissions Information System (WFEIS v0.5). This data set contains modeled annual wildland fire emissions from 2001 to 2013 for the conterminous U.S. and Alaska distributed as GeoTIFFs of 0.01 degrees (~1-km) resolution and ESRI shapefiles. Fires are mapped to within 8 days of the initial burn in 500-m grid cells using the MODIS MCD64A1 burned area product. Accurate burn dates for individual fire events allow for consideration of fuel conditions driven by weather, such as fuel moisture. Fuel availability is mapped by strata and fire potential to 1-km cells using the Fuel Characteristic Classification System (FCCS; Ottmar et al. 2007). 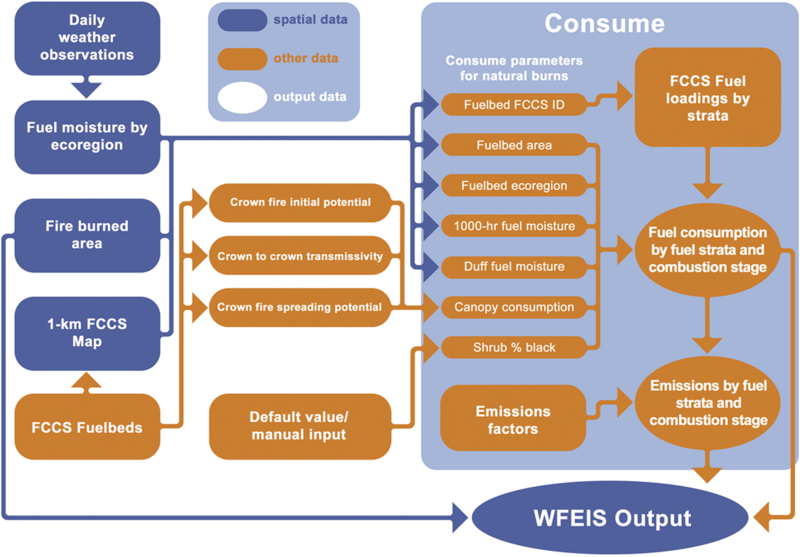 Emissions were estimated by the Consume model which relates fuel loadings from the FCCS and weather-based fuel moisture conditions at the time of the burn to fuel consumption to quantify the various types of emissions (Prichard et al., 2009). The spatial data files track the location and magnitude of the various wildland fire emissions types by year. This data set was produced using the Wildland Fire Emissions Information System (WFEIS) Emissions Calculator (http://wfeis.mtri.org/) hosted by Michigan Tech Research Institute and supported through grants from the NASA Carbon Cycle Science Program, the NASA Applications Program, and the NASA Carbon Monitoring Program. The WFEIS is a web-based tool for computing wildland fire emissions across CONUS and Alaska at landscape to regional scales from 1984 through 2013. This data set and the WFEIS tool are resources for fire researchers and atmospheric scientists to study how past fires have contributed to emissions that influence air quality and carbon cycling. GeoTIFFs are provided at 0.01 degree horizontal resolution (approximately 1-km). Features in the ESRI shapefiles represent areas of equal modeled emissions within the mapped fires. Data covers 2001 to 2013. Each GeoTIFF and Shapefile represents the collection of fires that occurred during a given year. Annual carbon and CO2 emissions estimates in tonnes are provided as 78 GeoTIFFs at 0.01 degree spatial resolution. For Alaska, one GeoTIFF is included per emission type (carbon and CO2) per year (13) for a total of 26. For the CONUS, two GeoTIFFs are included per emission type (carbon and CO2) - one depicting emissions from natural fuels and the other combining emissions from both natural and agricultural fuels - per year (13) for a total of 52. "_w_ag" appended indicates the inclusion of emissions from agricultural fuels. ESRI shapefiles include emissions estimates for carbon, CO, CO2, CH4, NMHCs, PM, PM2.5, and PM10 as well as measures of aboveground biomass, total fuel availability, and consumption. 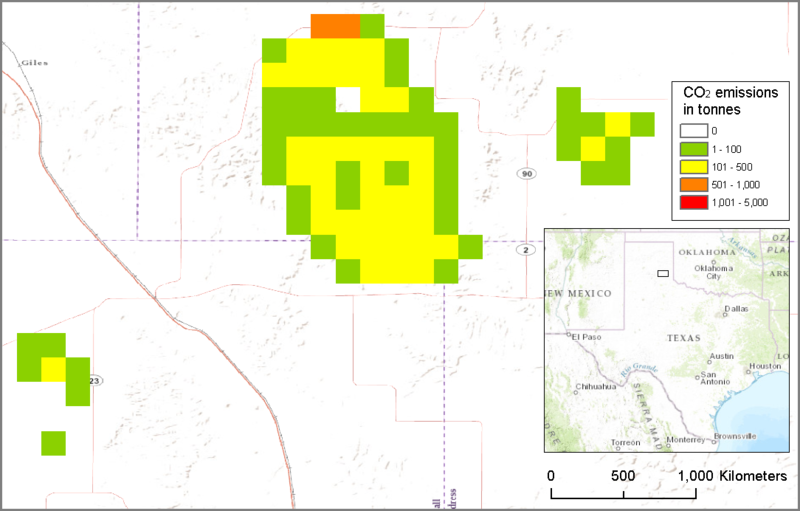 Estimates from a single fire may be represented by multiple features within each shapefile. For Alaska, emissions from natural fuel sources are included in 13 shapefiles. For CONUS, emissions from natural fuels and combined emissions from both natural and agricultural fuels are represented as pairs of shapefiles for each year, for a total of 26. Table 1 describes the measured parameters contained within each shapefile. where YYYY is the year 2001 - 2013 and "_w_ag" is appended to indicate the inclusion of emissions from agricultural fuels. Features were aggregated by each unique set of input parameters (date, fuelbed ecoregion, 1000hr fuel moisture, duff fuel moisture, and fuelbed id) because they result in areas with equal emissions estimates. Figure 2 shows features within conus2001.shp that make up the burned area from a northern Texas fire. The features are colored by unique value for each of the five input parameters. This is the same fire as shown in Figure 1. Figure 2. This figure illustrates the common input parameters used to aggregate features within the shapefiles. Each unique set of values for these five parameters result in equal modeled emissions estimates. This annual fire emissions product was output by the WFEIS (French et al., 2014) with full coverage of the CONUS and Alaska. Researchers might use this data set to examine variability of emissions from one region to another or across one region over time. The spatial data files track the location and magnitude of the various wildland fire emissions types by year. No uncertainty estimates are published for this particular data set; however, a variety of outputs from the WFEIS tool have been compared with published emissions estimates from the Global Fire Emissions Database version 3 (GFED; van der Werf et al., 2010). WFEIS emissions estimates were higher in some years and lower in others compared to those produced by the GFED, but similar overall. The results of this comparison are illustrated in Figure 3. WFEIS and GFED both use the MODIS MCD46A1 burned area product. Assessment of the uncertainty of the FCCS is underway by the Michigan Tech Research Institute and the U.S. Forest Service and funded by the Joint Fire Science Program. Figure 3. Comparison of CO2 emissions computed within WFEIS (using both the MODIS and Landsat burned area products) to results from the GFEDv3 database (van der Werf et al. 2010). The WFEIS uses the Consume model to produce yearly fire emissions products contained in this data set. The Consume emissions model (http://www.fs.fed.us/pnw/fera/fft/consumemodule.shtml) was developed by the U.S.D.A. Forest Service and uses inputs from derived burned area products, vegetation maps, and weather station readings to estimate fuel consumption based on loadings and moisture (Prichard et al., 2009). A diagram of the Consume workflow employed by the WFEIS is seen in Figure 4. Figure 4. Schematic of the Consume model used by WFEIS. MODIS MCD64A1 burned area product: Polygons of burned area were derived from the MODIS MCD64A1 burned area product to define the spatial and temporal extent of fires occurring in the CONUS and Alaska between 2001 and 2013. MODIS MCD64A1 takes advantage of the twice-daily global coverage of the MODIS sensors to resolve fire timing within one day (Giglio et al., 2010; http://modis-fire.umd.edu/pages/BurnedArea.php). Fuel Characteristic Classification System: Fuel availability for the mapped fires was determined using the FCCS. The FCCS is a system for describing fuel beds based on their composition and structure (FCCS; Ottmar et al., 2007; http://www.fs.fed.us/pnw/fera/fft/index.shtml). 1000-h time-lag fuel moisture: 1000-h fuels are large, dead woody debris 7.6 to 20.0 cm in diameter. Moisture content is tracked by the U.S. National Fire Danger Rating System (NFDRS) using weather data for the previous 7 days (Ottmar and Sandberg, 1985) and used to produce maps of daily fuel moisture retention by ecoregion (Bailey's level 2). Shrub blackened was left at the default 50%. 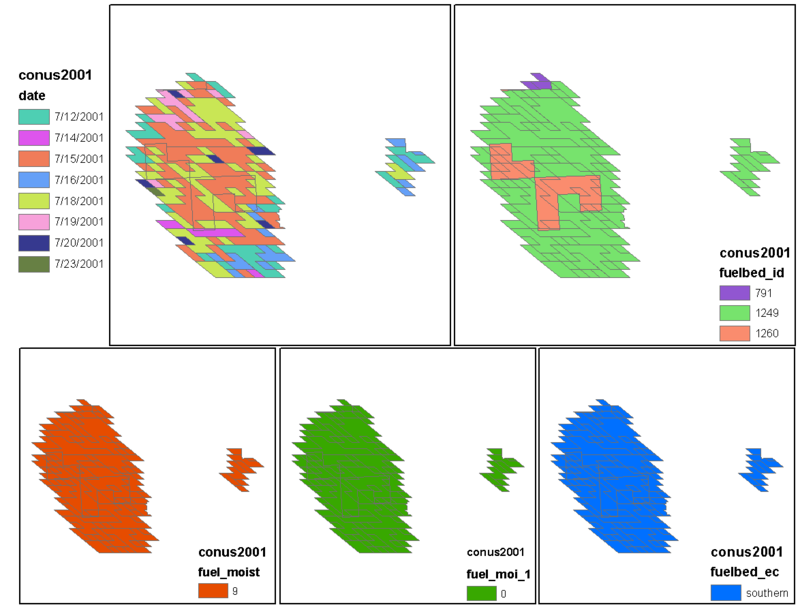 This is a user-specified parameter set based on field observations. Based on consumption estimates, the Consume model uses coded emissions factors compiled by the Forest Service to calculate emissions of CO, CO2, CH4, particulates (PM2.5 and PM10), and non-methane hydrocarbons by fuel stratum and combustion stage (flaming, smoldering, and residual burning). Emission factors used by Consume are available from the WFEIS webpage: http://wfeis.mtri.org/media/img/A3-EmissionFactors.pdf). Giglio, L., J.T. Randerson, G.R. van der Werf, P.S. Kasibhatla, G.J. Collatz, D.C. Morton, and R.S. DeFries. 2010. Assessing variablity and long-term trends in burned area by merging multiple satellite fire products, Biogeosciences, 7, 1171–1186, doi:10.5194/bg-7-1171-2010. Lawson, B. D., G. N. Dalrymple, and B. C. Hawkes. 1997. Predicting forest floor moisture contents from duff moisture code values, Forestry Research Applications Pacific Forestry Centre Technology Transfer Note 6, 4 pp. Ottmar, R.D., D.V. Sandberg. 1985. Calculating moisture content of 1000-hour timelag fuels in western Washington and western Oregon, USDA Forest Service Research Paper PNW-336, 20 pp. Ottmar, R. D., D.V. Sandberg, C.L. Riccardi, and S.J. Prichard. 2007. An overview of the Fuel Characteristic Classification System (FCCS)- Quantifying, classifying, and creating fuelbeds for resource planning, Canadian Journal for Res., 37, 2383-2393, doi:10.1139/X07-077. Prichard, S.J., R.D. Ottmar, and G.A. Anderson. 2009. Consume 3.0 user’s guide, USDA Forest Service Pacific Wildland Fire Sciences Laboratory Rep., 239 pp. van der Werf, G. R., J.T. Randerson, L. Giglio, G.J. Collatz, M. Mu, P.S. Kasibhatla, D.C. Morton, R.S. DeFries, Y.Jin, and T.T. van Leeuwen. 2010. 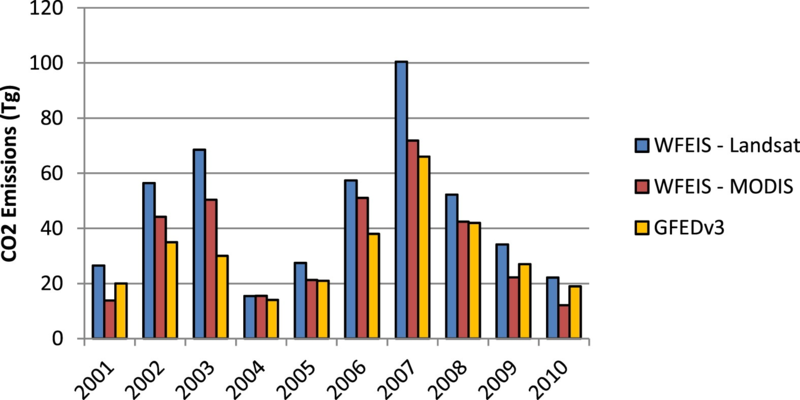 Global fire emissions and the contribution of deforestation, savanna, forest, agricultural, and peat fires (1997–2009), Atmos. Chem. Phys., 10,707–111, doi:10.5194/acp-10-11707-2010. van Wagner, C. E. 1987. Development and structure of the Canadian Forest Fire Weather Index System, Canadian Forest Service Forestry Tech. Rep. 35, 48 pp.